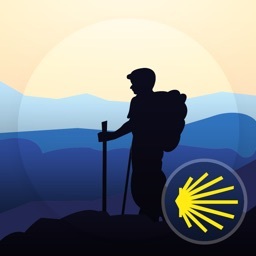 Camino Assist, is designed to assist you in everything you need to do the Camino de Santiago (The Way of Saint James). 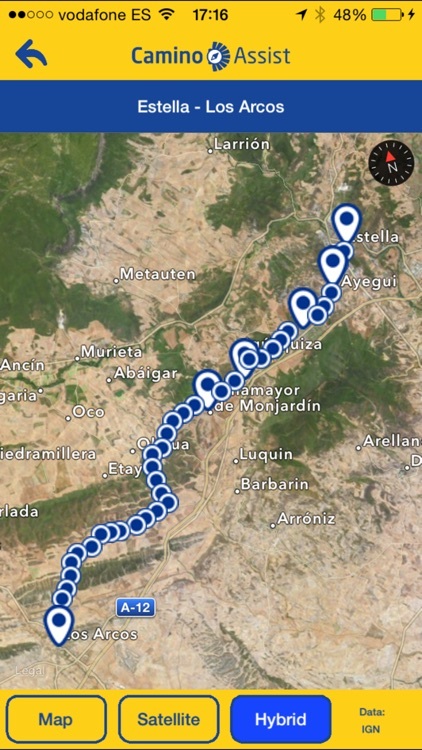 It is the perfect tool to use before, during and after your experience on the Camino. Is a multilanguage aplication, currently available in English, Spanish and French. The App organizes the different “Ways” by zones. 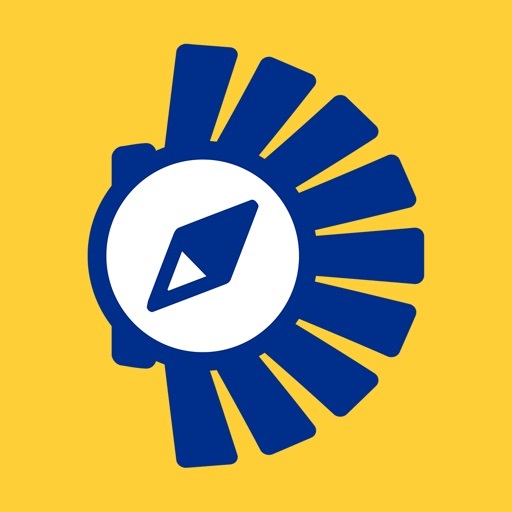 You can buy the zone of your interest to access to all the features of the App and check the complete itinerary with plenty of information about every stage. Zones currently available: Camino Francés zone (Camino Francés, Camino Francés Vía Navarra, Camino Francés Vía Aragonesa, Camino Francés Adaptado), North zone (Camino del Norte, Camino Primitivo, Camino del Salvador, Way of Human Rights, Camino Lebaniego), West zone (Camino Portugués from Tui, Camino Portugués from Lisboa, Camino Inglés Vía El Ferrol, Camino Inglés Vía A Coruña, Prolongación Jacobea to Fisterra-Muxía) and Central Zone (Camino de Madrid). 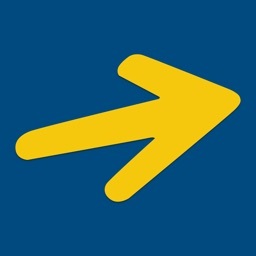 In subsequent updates the App will incorporate new “Ways” and new zones. You can also update the zone you have already purchased with new available “ways” at no extra cost. We also have a new free zone, the Camino Towns zone. It currently includes the Cultural Route of Santiago de Compostela. - You can plan the trip, learn about the different itineraries, check all kind of information about the stages, distances, profiles, accommodations and points of interest. -Our small guide with “Basic Tips” to prepare you for the Camino will help you with the planning and equipment. The app offers you written and voice notes so you can project in advance what would you want to do, visit or buy at every stage. 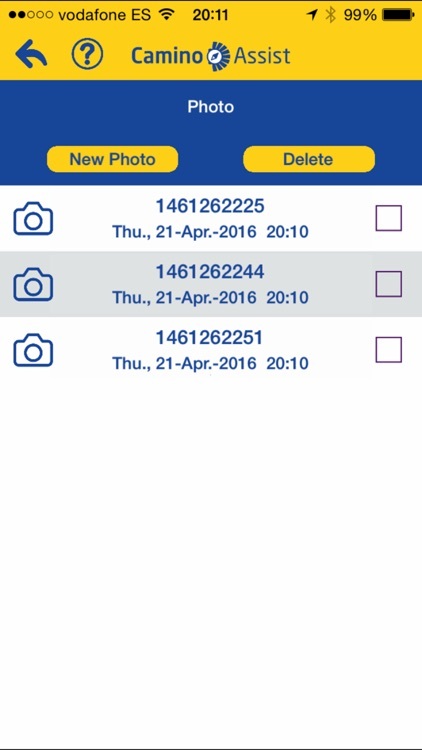 You can transfer all the information to the application so you can recall it during your pilgrimage. 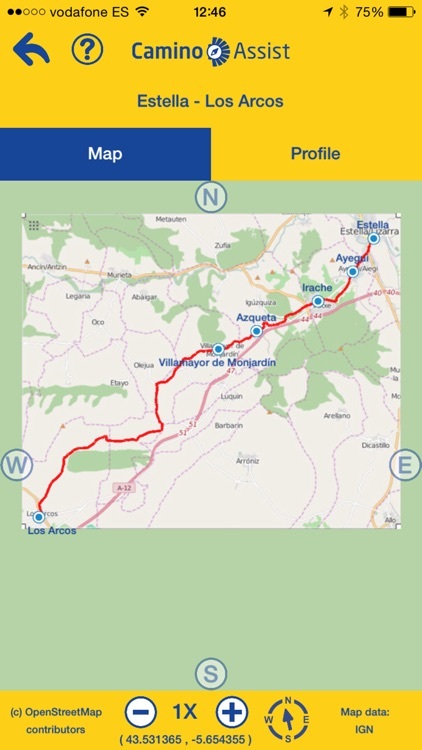 - Once you have started your way, you can keep on your journey through a “Subway Style” map which offers you complimentary information about the itinerary, stages and locations, as well as access to other “Subway Style” maps about the particular stages and possible diversions or combinations of the path. - Geolocation of the tourist offices, accommodations, points of interest. - You can also have a journey log in which you can add text notes, voice notes, photos and videos during your trip, or recall all the information that you have already added during the preparation of your Way. 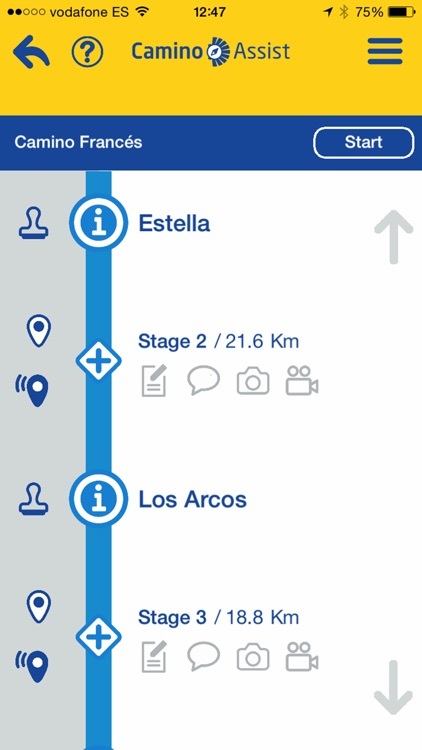 - You will have access to maps and Offline profiles (no data connection required) of each stage, as well as Online maps (requires data connection) to provide bigger accuracy during your journey. 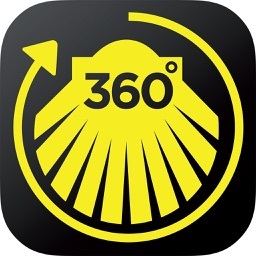 In the Offline maps you will have GPS positioning and compass without Internet connection, if your device has GPS. You have 2 types of Online maps. - When you have finished your Camino experience (we are confident that you will repeat it...), you can recreate your pilgrimage as everything you wanted to remember about your way will be reflected in your written notes, voice, video and pictures. 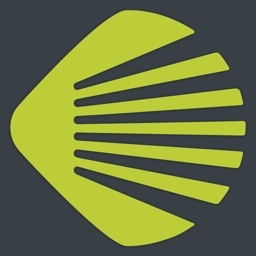 - Information about how to contact the different Associations of Friends of the Camino de Santiago along the Way. - You can access real-time weather information and forecasts. - Security: you can share or send to family and friends your geolocation GPS at any time, or use the SOS button for make a direct call to 112 emergency Spain. 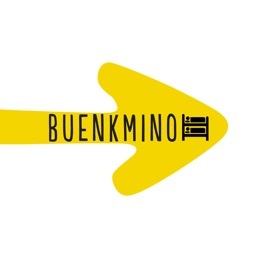 - Multilingual dictionary with common phrases for the Camino de Santiago translated into Spanish. You can read them from the phone or the application can verbalize them for you. - You can share your experience in social networks, sharing photos and places that you are visiting. - You can stamp your completed stages, and thus see the progress on your way. - Backup function of the data generated in Camino Assist. 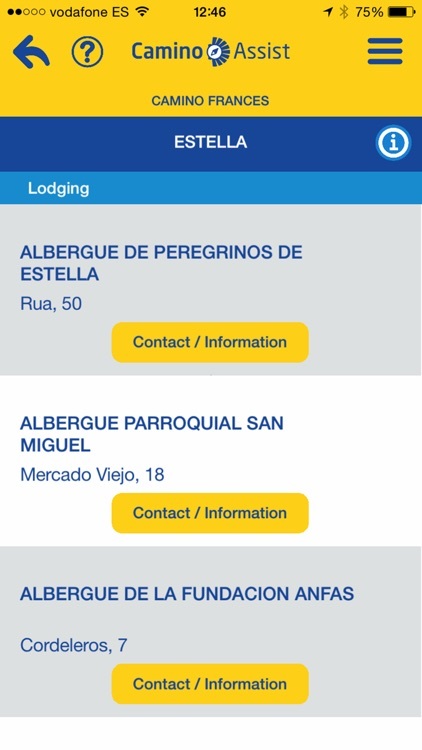 With Camino Assist you will enjoy an application which is constantly updated with new developments and new features. Camino Assist ... You just walk.